The Thompson Center T/CR22 is a lightweight .22 rifle that is sure to impress any rimfire shooter thanks to its ergonomic Magpul stock, easy to operate semi-auto action, and excellent accuracy. This package deal adds even more value with the inclusion of a soft case, rifle sling and red/green dot sight. Compatible with most 10/22 parts and magazines, the T/CR22 is bound to be your new favorite plinker. Don't miss out on this great package deal and buy today from GrabAGun! Best price that I was able to find on this particular package. I have another TC rifle so I know it is high quality and this is a great deal. Great quality and price for this package deal. All I have read This is a great little rifle. 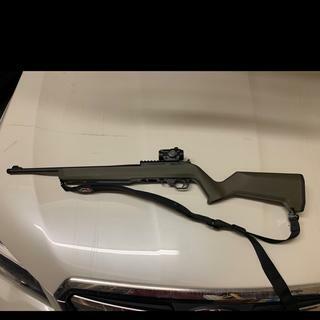 I am a big Magpul fan and have a 10/22 takedown that is decked out. Wanted to get another gun to plink around with. This T/C has awesome reviews and can accept standard ruger 10/22 magazines I already own. This bundle is almost too good to be true. I will definitely mix and match with my current setup. Good price. Liked what was included in the package. Was looking at the Thompson Center T/CR22 for my grandson earlier. Have purchased a number of guns through GrabAGun and have had good service so far. I liked the features offered for this semi-auto 22, and the price was right. A friend recommended Grabagun and this particular product. Thought I’d give them both a try. It seems like a very fair price. seemed like a good deal on a gun I have heard good things about. Nice package and best price. HAVE HEARD NOTHING BUT GOO THINGS ABOUT THIS PLINKER..
Good price and it included the case, sling and red dot. The value and extra accessories included. Heard good things about it. Who makes the red dot that comes with the gun? Is it any good? BEST ANSWER: It doesn’t have any branding on it but it’s very similar to a primary arms red dot. As far as functionality and reliability, it’s been good. Holds zero so far (200 rounds shot). Great package deal, in my opinion. I have looked all over the red dot and the only thing it says is made in China. I have put around 500 rounds through the rifle with no issues. I own several red dots ranging from the MRO, a couple holosuns, primary arms and a bushnell trs25. I would put it just below the trs25. I just saw it as an added bonus and would recommend upgrading in the future. From what I saw/got it’s a no name Chinese small compact red/green dot sight. I haven’t used it on this rifle as I wanted some magnification but from all I’ve seen it’s well built and I think would do a fine job on this rifle system or on a handgun or maybe even a shotgun. Hope this helps. The red dot itself has no brand markings. The instructions that come with it show it being mounted on the tcr22, so I assume that Thompson or an affiliated company makes it. It is a quality red dot sight, as far as I know. The eye relief and height of the sight is great on this gun. No idea who makes it. It is okay, not fantastic. It will zero without much fuss, not sure I would expect to use it on anything more powerful. Great gun right out of the box ! yes it's the next best thing to them. Absolutely awesome. Very nice that it works with 10-22 magazines, it's the perfect plinker. Love the gun love Grab a Gun more! Very nice experience for me being a first time as an online gun buyer! Very easy, and quick shipping. Purchased for my sister's 18th birthday and couldnt be happier. The TCR22 is a nice quality gun and unbeatable for the price. I am very satisfied with the build quality and ergonomics. Very light weight, but solid feeling. Works great! As good as any 22 I’ve shot. The shooters package is well within industry pricing and I found it an excellent deal. Have only shot the 10 rounder so far. But so far every part of the gun has met or exceed my expectations. Great looking and feeling gun,can't wait to shoot it. I've taken the rifle out to shoot a couple of times now and I have no complaints. I love the built in picatiny rail and the sights the best. Looking forward to all the aftermarket support for this gun, it surely deserves it like the Ruger 10/22 does. Highly recommend this .22lr. Red dot isn't great but a 3-9 scope is a better fit anyways. I finally dumped my pathetically unreliable 10/22 and was looking for a replacement. After seeing this with positive reviews I finally snagged one and glad that I did. Thus far 100% reliability with the CCI Minimags & Aguila super extra high velocity rounds I ran thru it using the TC mag and a leftover Ruger 10 rounder I had. Definitely worth the price. Sling, case, and cheap red dot are all serviceable. Great rifle, accurate with reliable action. Gr8 buy with nothing negative. Reliable, fun, bulletproof! Just as advertised. Sweet little gun. Gonna have some fun with it! Nice gun for the Money. Very Light, Clean Barrel before shooting and oil the entire Action very dry. The Thompson Center T/CR22 is built with every kind of rimfire shooter in mind, whether they enjoy hunting, plinking or competition. It features a smooth functioning semi-auto design that is simple to operate, maintain and customize. The rifle is fitted with a Magpul ergonomic, lightweight composite stock with modern contours that offers durability and quick handling which also includes M-Lok compatible slots under the forend for accessory mounting. The machined 6061 aluminum receiver features a built-in picatinny rail and adjustable peep rear sight paired with a fiber optic front for quick target aquisition. If also featues a threaded barrel that is button-rifled and provides outstanding accuracy with a variety of ammo. This combo version includes a T/C branded soft case, a sling and red/green dot sight for a ready to shoot package right our of the box.